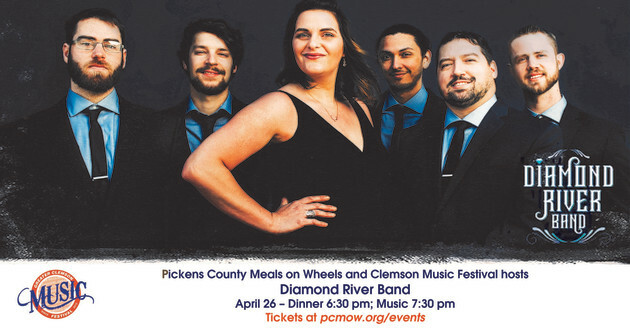 Pickens County Meals on Wheels and Clemson Music Fest is excited to announce we will host the Diamond River Band on April 26th, 2019, 6:150pm at the McKissick Center (home to PC Meals on Wheels). Diamond River Band is an Asheville, NC based band comprised of some seriously talented and versatile musicians and powerhouse singers. This band has a special emphasis on country, classic rock and current hits twisted with a modern edge. Each band member brings their own unique experiences creating strong gritty vocals with rich harmonies combined with a dynamic backbeat that will ensure you and your guests are entertained and on the dance floor all night long. Tickets will include appetizer, dinner and concert.